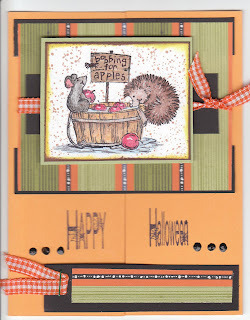 Your cards for Halloween are really adorable. We don't go in for Halloween as much as you guys so this is fun to see. Hi, I read suzie's blog and she sent us over to say 'hi'. I can't believe how much you two look alike. The resemblance is amazing. I think its great that you stamp and blog! Congrats on your new blog. Your cards are lovely. I love that you all stamp and blog! Yeah to the mom of some of my favorite peeps! Another beautiful blog to read! Thanks for your sweet comment this afternoon! Love these little hedgies. Such a cute card!